© 2002, © 2018 by Paul Freeman. Revised 4/18/18. The "Landing Field", as depicted on a "pre-WW2" AAA road map (courtesy of Francis Blake). located in an extremely desolate part of the Southern California desert, just northwest of Yuma, AZ. which labeled the site simply as "Landing Field". The map appeared to show the airfield area as extending east/west across the road. including its actual name, or dates of construction & abandonment. nor on aeronautical charts from 1934 or 1945.
asked an older, retired Fish & Game officer about Imperial Gables. The latter said Imperial Gables was at some time a brothel & moonshiners' place of business. so I'm guessing the airfield was for VIPs' visits. so the road had to be rerouted to its current position (and smack through the Northeast/Southwest runway)." Nothing at all is depicted at the site on USGS topo maps from 1953, 1969, 1980, or 1992. 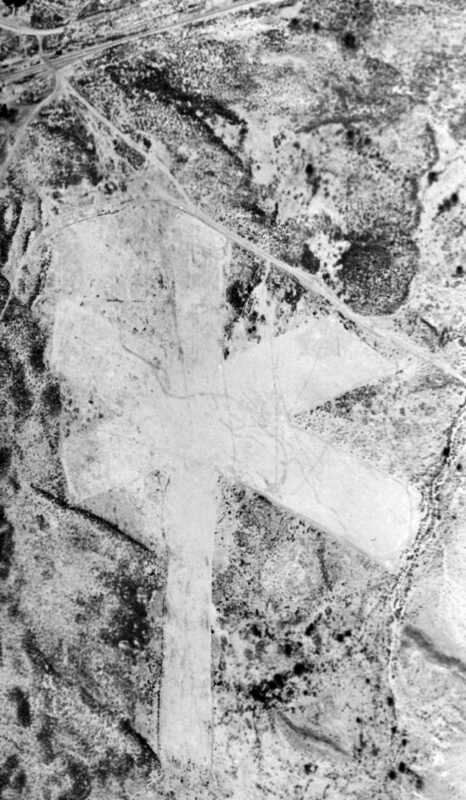 In a 1996 USGS aerial view looking east, the remains of the Imperial Gables airfield were still recognizable. and a shorter northwest/southeast strip on the west side of the road. 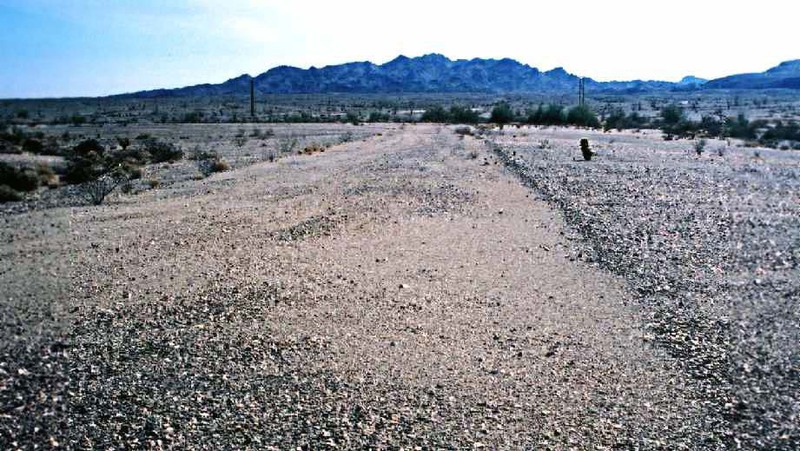 A 2003 photo by Francis Blake (enhanced by Bill Grasha), looking east along the abandoned east/west runway at Imperial Gables. Francis Blake reported that "the runways haven't been used for some time. A portion of [the southwest/northeast] runway is being used by the highway maintenance department for gravel storage." A 2014 aerial view looking east shows the remains of 2 Imperial Gables runways to remain quite recognizable. Duncan Woods reported in 2015, “I went right by the site of Imperial Gables Airfield & stopped & looked around. 14 miles northeast of Glamis, CA. Thanks to Francis Blake for pointing out this airfield. "North Coyote Wells (Navy)" airfield, as depicted on the March 1944 San Diego Sectional Chart (courtesy of Ron Plante). It was also known as Coyote Wells #2 NOLF. nor on the 1944 USGS topo map. It depicted "North Coyote Wells (Navy)" as an auxiliary airfield. Outlying Fields & Emergency Landing Fields” (courtesy of Brian Rehwinkel). with a circular bombing target to the north of the runway. No buildings were depicted at the field, which was said to have no facilities. 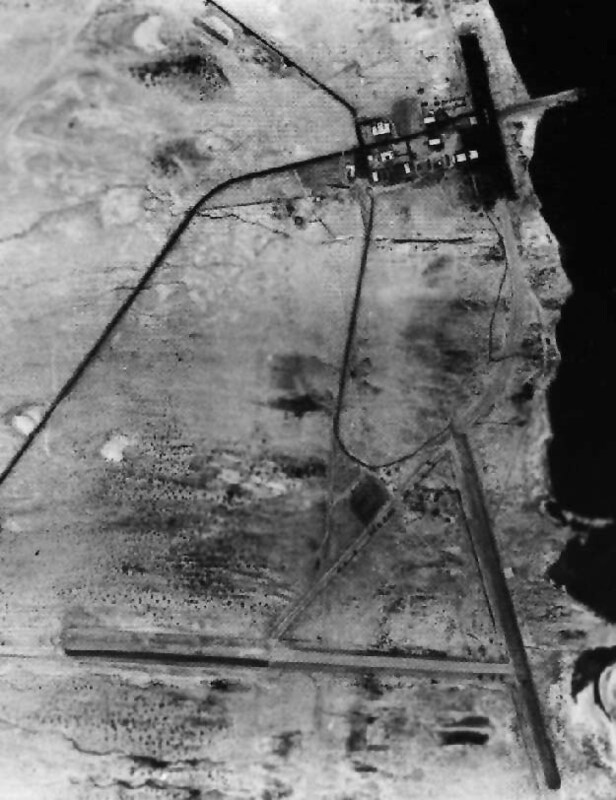 depicted "North Coyote Wells (Navy)" as an auxiliary airfield. as a rectangular property containing a single 2,600' east/west sandy silt runway. The field was not said to have any hangars. depicting "North Coyote Wells" at the top & "South Coyote Wells" at the bottom. 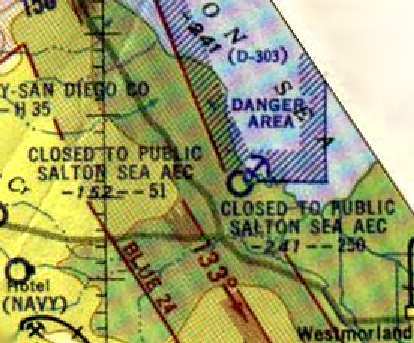 North Coyote Wells Outlying Field was described as having a 2,600' runway on the 1948 San Diego Sectional Chart (according to John Voss). the 1955 San Diego Sectional Chart, or the 1956 USGS topo map. 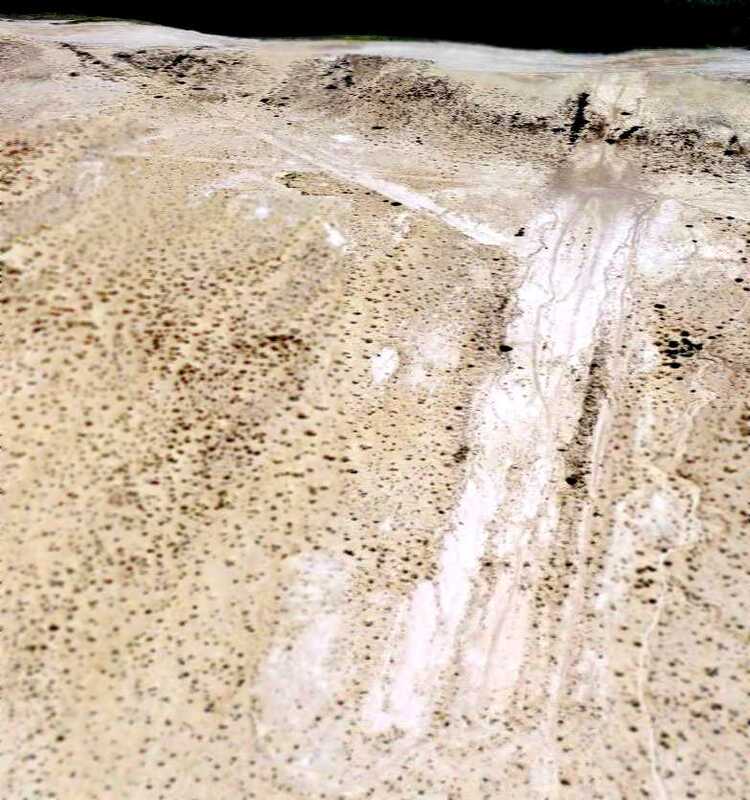 A 5/25/09 aerial view (enhanced by Bill Grasha) did not depict any trace of the former North Coyote Wells airfield. A 1996 USGS aerial view looking northwest at the Westmorland site. The actual name of this airfield is unknown. though it's not in the 'right' location, or maybe another old auxiliary field?" or on aeronautical charts from the 1940s through the present day. along with a much shorter perpendicular northeast/southwest runway. The remains of the 2 presumed runways remained basically unchanged in a 2014 aerial view looking northwest. 8 miles north-northwest of El Centro NAF. The date of establishment of the South Coyote Wells airfield has not been determined. was the 6/30/38 “Map of Leased Auxiliary Landing Fields, Naval Operating Base San Diego” (courtesy of Brian Rehwinkel). 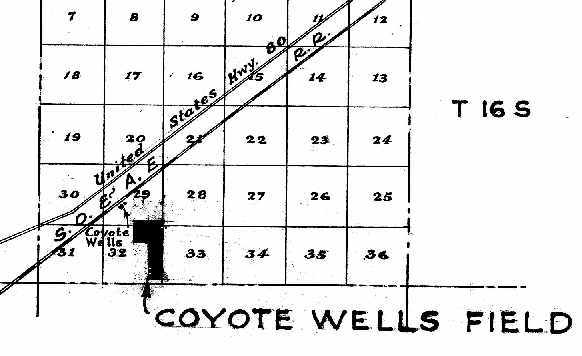 It depicted “Coyote Wells Field” as being located to the southeast of the town of Coyote Wells. 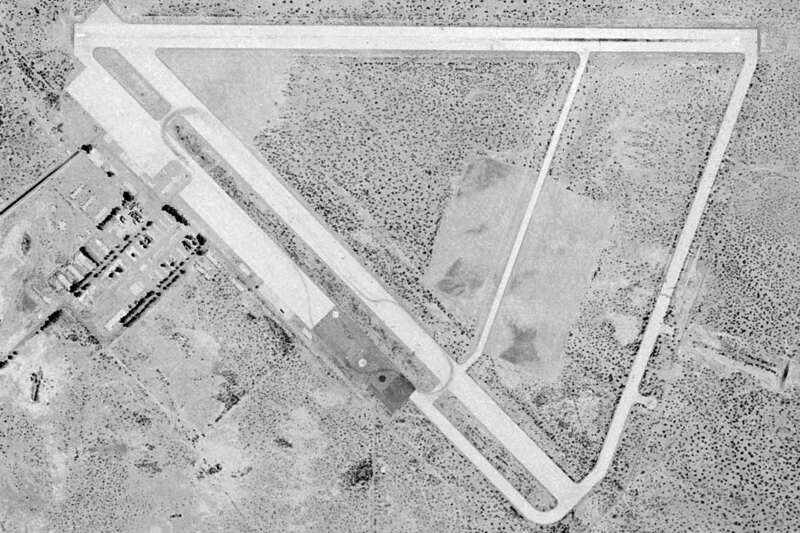 The earliest photo which has been located of South Coyote Wells Airfield was a 12/9/38 U.S. Navy aerial view looking north (from the National Archives, courtesy of Brian Rehwinkel). with a white airfield circle marking to the south of the runway intersection. There were no buildings on the airfield. Coyote Wells (South) Emergency Field was comprised of 215 acres. and the 215 acres was purchased by the Navy for $5,500. I don’t think this field was used much (as with the other Imperial Valley emergency fields). The Navy did consider paving the runways at this field, but decided against investing any more money into the facility. Interestingly enough, this field was the only emergency field in the area that was not associated with a bomb target. the navy was concerned about the heat damage caused to plane engines while climbing quickly for dive bombing. Their preference was to use fields closer to the coast. was one of at least 12 auxiliary airfields attached to San Diego NAS (North Island). It was also known as Coyote Wells #1 NOLF. nor on the March 1944 San Diego Sectional Chart (according to Chris Kennedy). 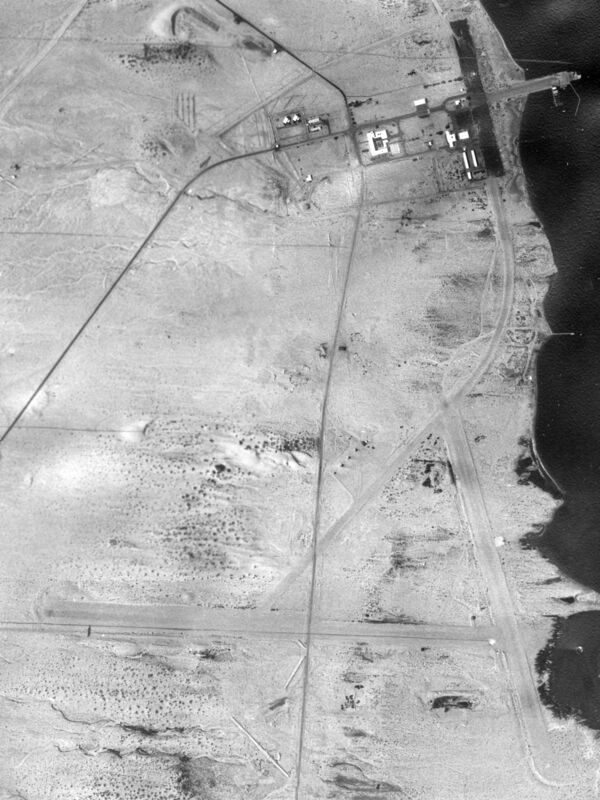 The last photo which has been located of South Coyote Wells Airfield was a 3/23/44 U.S. Navy aerial view looking (from the National Archives, courtesy of Brian Rehwinkel). 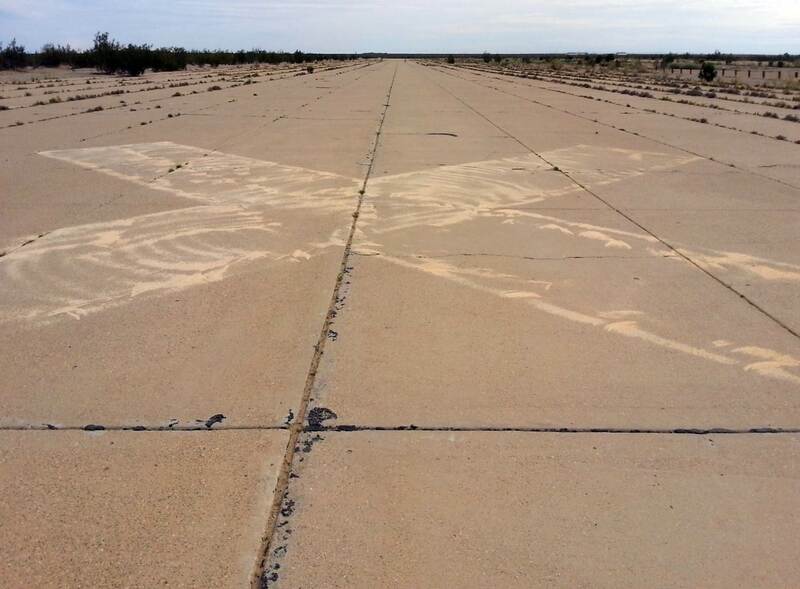 and the airfield circle marking to the south of the runway intersection was also still recognizable but deteriorated. 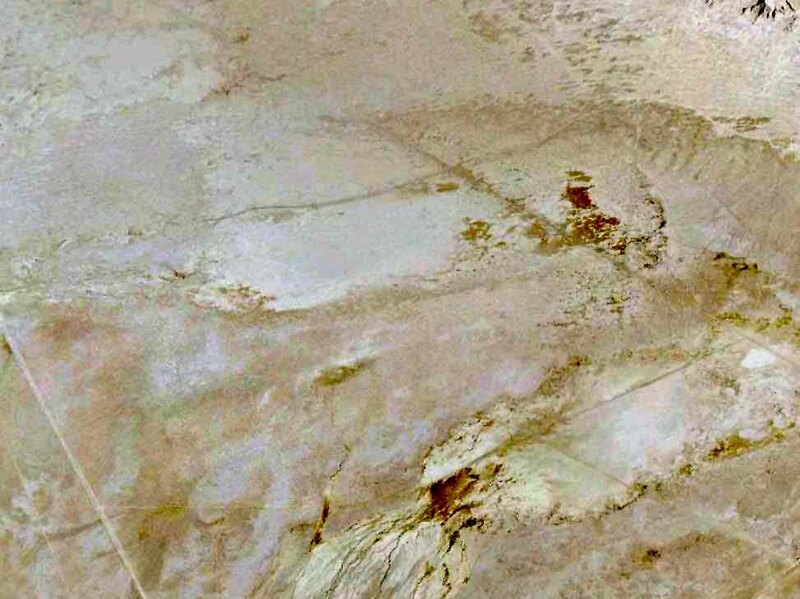 depicted “Coyote Wells (South) Field” as having three 2,500' sandy silt runways, oriented 18/36, 4/22, and 9/27. There were no buildings depicted at the field, only a single windsock to the southeast of the runway intersection. 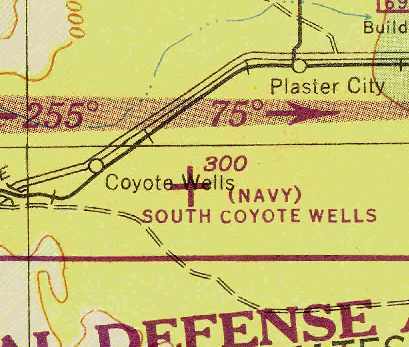 depicted "(Navy) South Coyote Wells" as an auxiliary airfield located 3 miles east of the town of Coyote Wells. Note that this was a different location compared to other depictions (which showed the airfield adjacent to the town of Coyote Wells), and may have been erroneous. 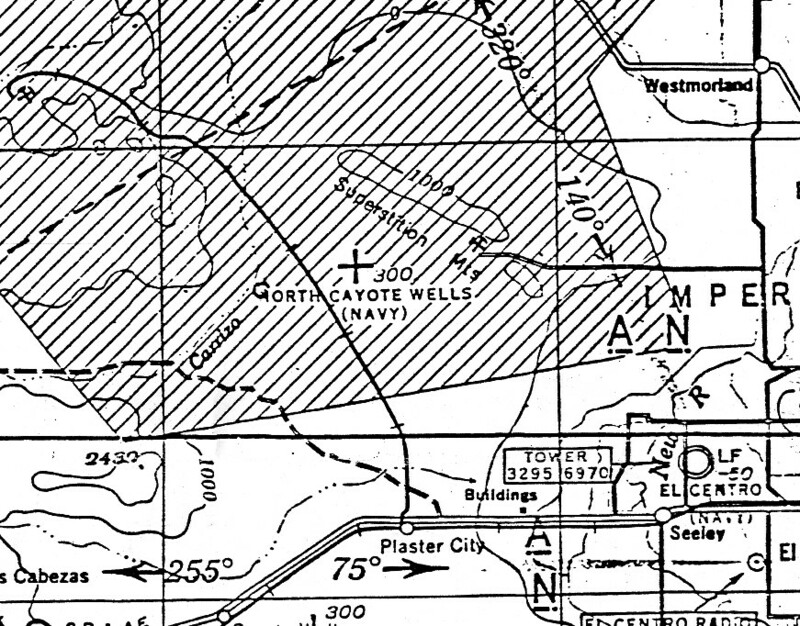 The 1948 San Diego Sectional Chart (courtesy of Chris Kennedy) depicted "South Coyote Wells (Navy)"
directly adjacent to the town of Coyote Wells. but the Aerodromes table described the field as "Closed". 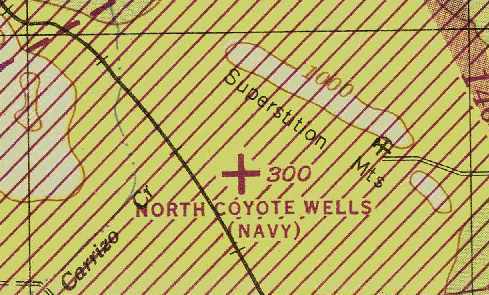 South Coyote Wells was depicted as a civilian airport on the 1954 USGS topo map. on the 1955 San Diego Sectional Aeronautical Chart(courtesy of John Voss). and included the remark, "Caution: Soft & rough." 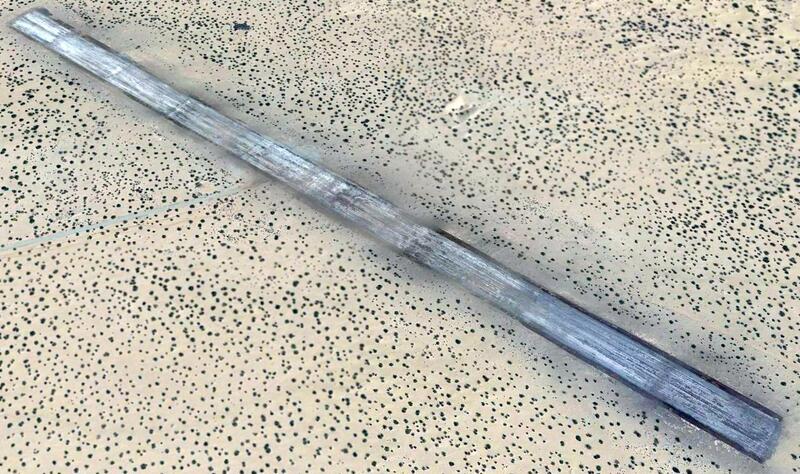 (along with other Emergency Landing Fields - Clark’s Dry Lake, Ocotillo Dry Lake, Borego Hotel). 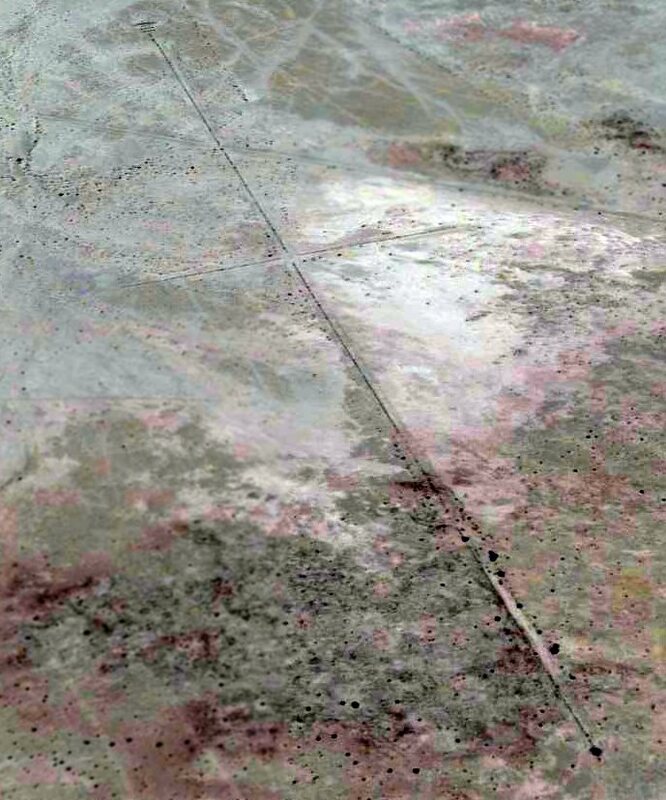 A 2014 aerial view does not appear to show any recognizable trace of the South Coyote Wells Airfield. 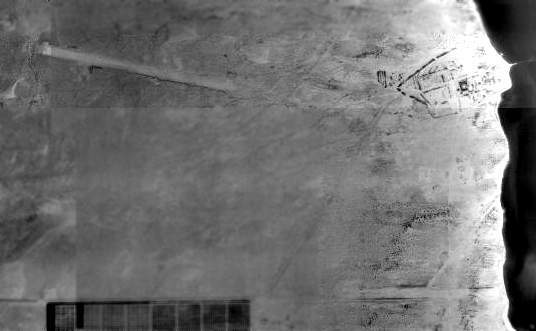 However, Brian Rehwinkel observed, “If you look very closely, you can still make out some of the 'white chalk' boundary markers that indicated the ends of the runways. The feature that really firms up the location is the railroad 'wye' just to the west of the field location. The site of South Coyote Wells NOLF is located south of the intersection of Interstate 8 & Moltar Road. “Holtville (Navy)”, as depicted on the August 1943 San Diego Sectional Chart (courtesy of Chris Kennedy). The Navy purchased 1,397 acres in 1942 to build an auxiliary airfield to support Navy flight training. Holtville was commissioned in 1943, under the command of Naval Air Center San Diego. The base initially had two 4,500' concrete runways. was on the August 1943 San Diego Sectional Chart (courtesy of Chris Kennedy). A flight simulator scenery depiction looking east at a Republic P-47 Thunderbolt overfltying NAAS Holtville. Holtville was used by the Navy to train pilots in skip bombing, night flying, and air-to-ground rocket firing. Aircraft operated at Holtville included F6F Hellcat & F4U Corsair single-engine fighters. but also had summertime temperatures routinely over 100 degrees. An atlas stated that Holtville & a spot in the Sahara desert were the hottest places on earth. located 8 miles to the east of the base along an unpaved road through the desert. An extensive construction program in 1944 significantly expanded Holtville's facilities. The 2 runways were extended to their ultimate length of 6,000'. 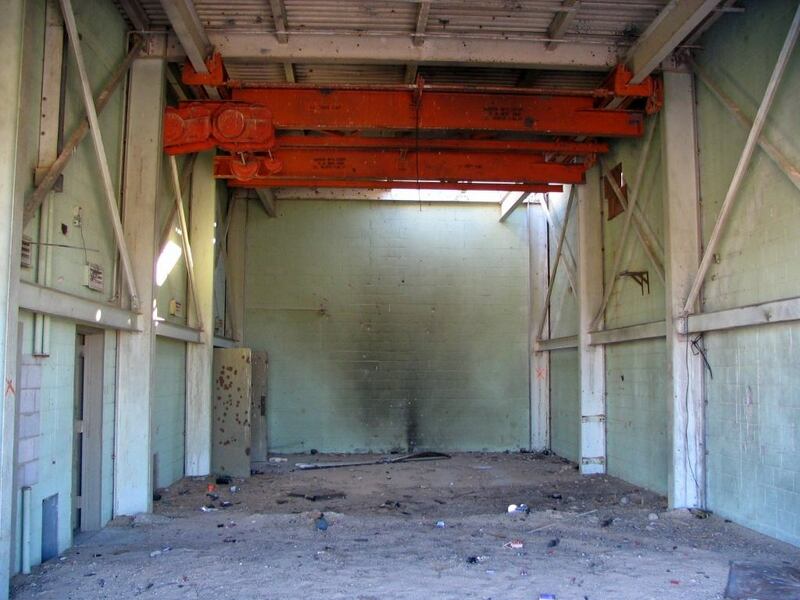 Two ground training buildings were constructed that housed Link Trainers & a Gunairstructor. Overall, the base's capacity was doubled, to support six squadrons. It had a total complement of 2,980 officers & enlisted. A 1944 aerial view looking north at the Holtville airfield (National Archives photo, enhanced by Bill Grasha). as a 1,400' acre irregularly-shaped field containing 3 concrete runways, the longest being the 6,000' northwest/southeast & east/west strips. The field was said to have 2 wooden 80' x 32' nose hangars. Holtville was was described as being owned by the U.S. Government & operated by the Navy. Holtville was used for a few months to store 111 "PV-2 Privateers" (a contradictory designation). 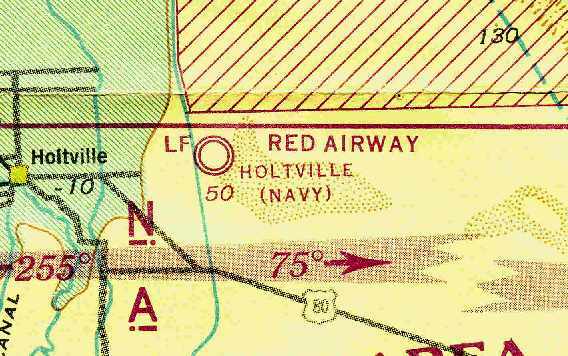 The station then went into caretaker status in 1946.
redesignated “Holtville NAAS” to “Holtville Airport”, as of May 27, 1946. Holtville was transferred to Imperial County for use as a county airport in 1947.
on the March 1951 San Diego Sectional Chart (courtesy of Chris Kennedy). It was depicted as having a 6,200' hard surface runway. and included the remarks, "OLF to NAAS El Centro. Use caution, concrete paving faulting." For some period after WW2, the airfield's buildings were reused as the Imperial Valley Sanitarium. and remember many of the airfields because I saw them in use during WW2. One airfield in particular is of note & that is the Holtville NAAS. It was turned over to Imperial County as a Sanitarium. It was an isolation sanitarium for TB patients." Chuck continued, "In addition, I worked for a crop dusting company as a loader in high school & college (1951-55). It was miserably hot - so was the rest of the area. We used the airfield as a loading spot for our crop dusters which we flew out of Imperial. when we dusted fields in the area. The hangers were abandoned, but usable. Some people stored their private planes in them. There were no servicing facilities so we had to bring our own gas if it was a long day of dusting. but we usually used the ramp for takeoffs because a Stearman takes off in no distance at all. I always look for the runways when I leave San Diego on a trip. Very obvious." Harry Gordon recalled, “In May 1952, I flew a friend's single-seat Schweizer 1-19 glider at Holtville Airport, towed aloft from the runway behind my 1936 Dodge. The airport was apparently unoccupied at the time & was identified as a Navy auxiliary field. While we were there, one other airplane landed, a Luscombe Silvaire. The occupants of the Luscombe were watching our glider flights & laughed when I overshot a landing & ran off the end of the runway (no damage). the Sanitarium was located in the main buildings of what had been a pretty substantial base. and these were occupied as well by perhaps a dozen families. 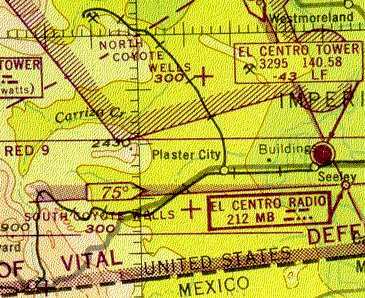 The 1957 USGS topo map described “Holtville Outlying Field” as having 3 paved runways, ramps, and buildings to the southwest. John Snapp recalled that one of Holtville's runways were used to stage drag races. "The Holtville Drag Strip was operated by the Imperial Valley Timing Association. The Holtville track was run from 1957-87. It never ran in the summer because of the extreme heat. It's biggest race was the annual Carrot Carnival Championship in February. 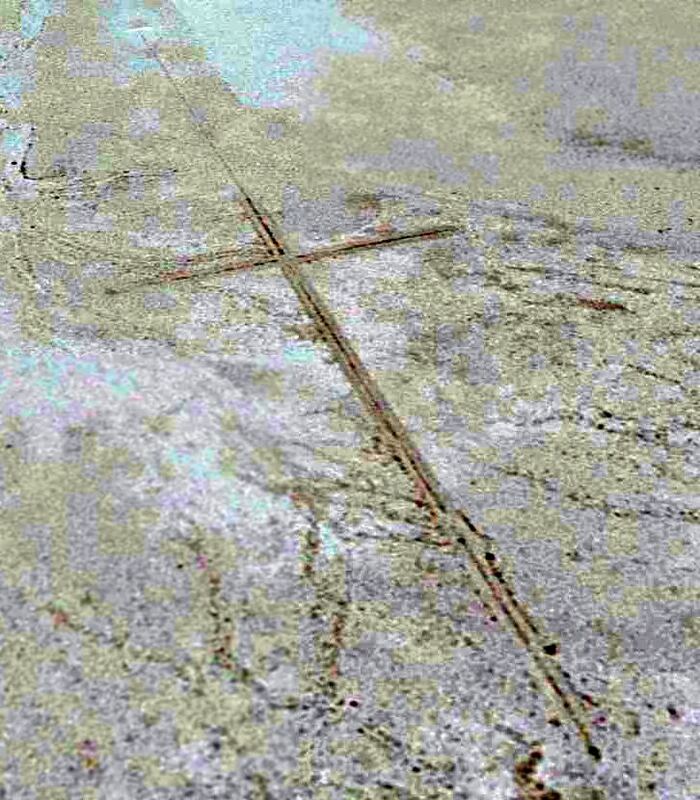 They used the [east/west] runway as evident by the black marks in the photo. It only ran once a month. It was NHRA sanctioned, although it did not have a guardrail that I am aware of. that was most likely laid out in squares which would explain the somewhat rough surface." Tom Wilson reported, “I am a private pilot & have also raced cars, and I've done both at Holtville NAAF. I raced with the San Diego Region of the Sports Car Club of America (SCCA). They raced every winter, consecutively, at the old airbase from approximately 1965-2000. Up until the mid-1990s these races were quite large (I recall one race with over 200 participant autos). get pushed together by seismic & thermal action, apparently. This causes random blocks to crack & fold into a steeply ramped V.
These V's can reach 3' in height. We would jack hammer them, remove the debris & pour new concrete to make a smooth transition. Nevertheless, the racing surface was always rough, and much car damage resulted in the lighter formula cars. Also, as there was no security at the field, all gear had to be locked up in an old semi-trailer. small stands for corner works & other equipment. Tom continued, “Many other car groups have used the SCCA track. 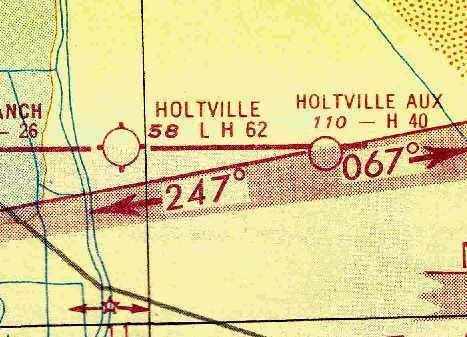 as "Holtville" was depicted as a civil airport on the 1966 San Diego Sectional Chart (courtesy of Chris Kennedy). According to John Snapp, the use of Holtville's runways for auto racing ended in 1987.
used Holtville NAAS for practice jumps much of the late 1980s & early 1990s. I do not know if they still do, but it was a great location at the time. It was close enough to North Island NAS for single days training. supposedly leased the Holtville airport from Imperial County. The foundation hosted at least 2 'airshows' out there. I know because my father & I went to them. I doubt you could really call them airshows because there was no real organized 'show'. Mostly owners of old military planes would fly in. They also put on a ground combat demonstration with people dressed as Americans & Germans. A temporary 'control tower' was erected for the 2 shows I went to. as did the B-25 "Pacific Princess" owned by The Planes of Fame from Chino." complete with buildings re-erected as they were during the war. But the group never really never got off the ground & soon went under. because I used to receive the newsletter from the foundation that had a photo of the company doing the work." due to it being conveniently close to my family's farm (which is about 2 miles northwest of the field). The runway was constructed from 8-10' square sections of concrete. Leading to a rather different "tha-thunk tha-thunk tha-thunk" rhythm to your takeoff. is what has allowed the concrete to last 60+ years in the desert climate. Temperatures are routinely over 110 & 120 isn't uncommon. More than once when visiting I had to taxi around the track being used by folks racing their rally cars. The runway pretty sound when I was using it. Tom Wilson reported, “In some of the aerial photos a southern section of the ramp is blue. A 1996 USGS aerial view of Holtville Airport. Tom Wilson observed that this photo does depict “the turnouts on the outer connecting taxiway. Curiously, these turnouts were not yet present in the 1944 aerial photo. "As of 2001, the Porsche Club of San Diego used the field for auto races." 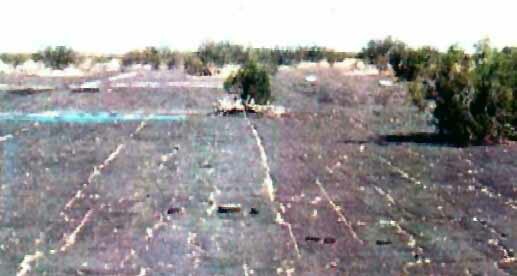 A 2001 photo (enhanced by Bill Grasha) of the decaying north end of the secondary runway at Holtville. A view south along Holtville's primary runway, 2001. A 2001 photo (enhanced by Bill Grasha) of a former ammunition bunker which remained intact at Holtville. (new fellow who took over from 'The Combat Heritage Foundation'). (rather silly as the concrete is 150' wide). I suggested that they declare the runway as 30' wide & the rest of the concrete be the boundary - and that had been thought of. The Army Corps of Engineers reported in 2001, "The field gets very little use & is not maintained by the County." A 2002 aerial photo of Holtville by Suresh Atapattu, used with permission. Tom Wilson reported, “The piles of debris on the outermost connecting taxiway are seaweed. Some fellow thought he was going to corner the market on kitty litter with his seaweed product. As of 2002, it is still listed in the Airport Facility Directory as an active civil airport, but Holtville Airport is all but abandoned. Both of the runways still exist, as well as the taxiways & the large concrete ramp. 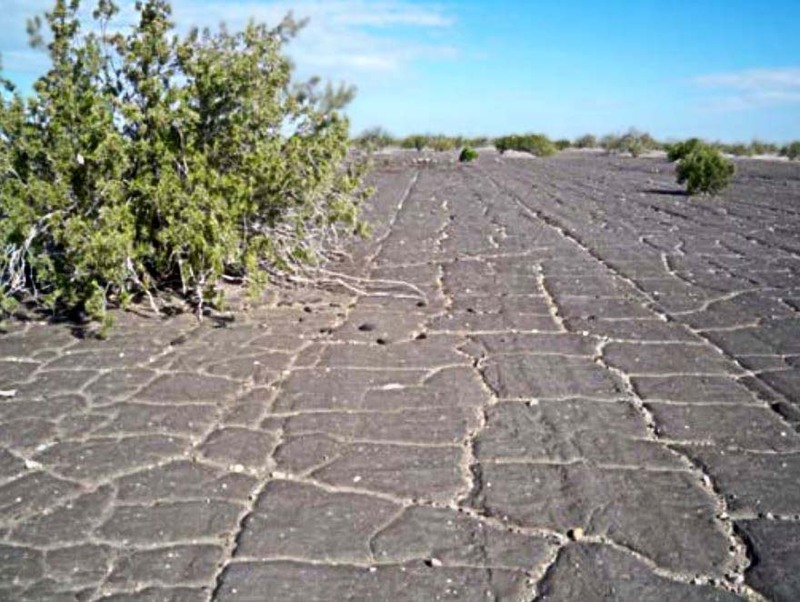 "in poor condition, pavement cracked with vegetation growth & spalling." Only the foundations remain of most of the original military buildings. only the concrete ends are still standing." "Be alert frequent military training activity during daylight hours & dark; includes tactical aircraft, helicopters & parachuting. No vertical takeoffs or landings permitted at airport AV-8 Harrier." The British Army parachute team has also been reported to have used Holtville for training. The primary remaining use of the airfield is to host occasional auto races on its runways. A 2003 aerial photo of Holtville by Bob Jones. Bob Jones flew to Holtville in 2003, and observed that closed-runway "X" symbols have been placed on both runways. "The pilot's guide showed it as open, but the locals say that it has been closed for years." A representative from Imperial County said that the State had ordered Holtville closed until specific repairs were made. and until that happens, the Holtville Airport will supposedly remain closed. Will McCown reported in 2005, “The airport is currently listed as active, but the runway is NOTAM'd closed. Woodrow Anselen reported in 2008, “Arriving over Holtville, I circled the field twice. and he gave me the odd answer that the closure was a political issue, and he could not comment on that). The 3rd runway is in very bad shape. It appears to have been deliberately dug up, and there is a lot of debris on it. but I opted for northerly landing on the remaining runway as the wind favored a northerly landing anyways. Woodrow continued, “I exited the aircraft into a furnace-like heat. Adjacent on the east side of this runway is an RV park. Pretty weird place for an RV park! What is the attraction? Maybe people live there permanently? The ammunition bunkers seen in previously taken pictures are still there, although somewhat removed from the field. a large field of tall weeds in order to reach them: Rattlesnake country! Even so, I was able to see that the bunkers are much dilapidated, and none that I saw was entirely intact. A 2008 photo by Woodrow Anselen (enhanced by Bill Grasha) of Woodrow's 1998 American Champion Scout on the runway at Holtville. An 11/25/14 photo by Jim Jordan of the Holtville ramp. Jim reported, “What was very interesting about the Holtville NAAS was how busy it was with military operations. There was some British paratrouper training (my guess is high altitude jump low altitude opening) and those guys were pretty much unmarked. They took off for lunch & an Osprey [V-22] moved in for some touch & goes. I talked to the guy from the Osprey crew & told him I was expecting a quiet day at Holtville. He said that did not happen very often! An 11/25/14 photo by Jim Jordan of a Holtville ammunition bunker. A 1/25/15 photo by Andrew Puyot Bañuelos looking along Holtville's northwest/southeast runway, showing the closed-runway “X” symbol. A 1/25/15 photo by Andrew Puyot Bañuelos of one of several concrete slabs of Holtville's northwest/southeast runway which have inexplicably been raised off the ground. 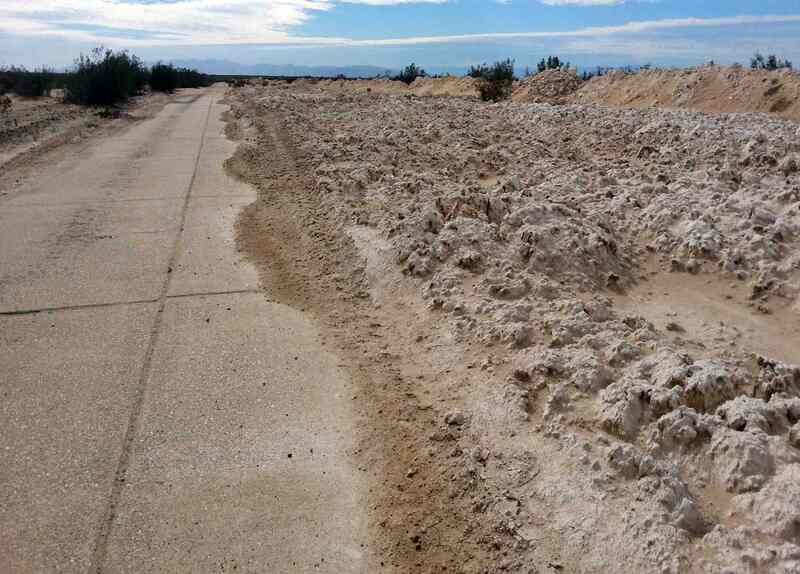 A 1/25/15 photo by Andrew Puyot Bañuelos of the piles of presumed “seaweed” which cover Holtville's east/west taxiway. 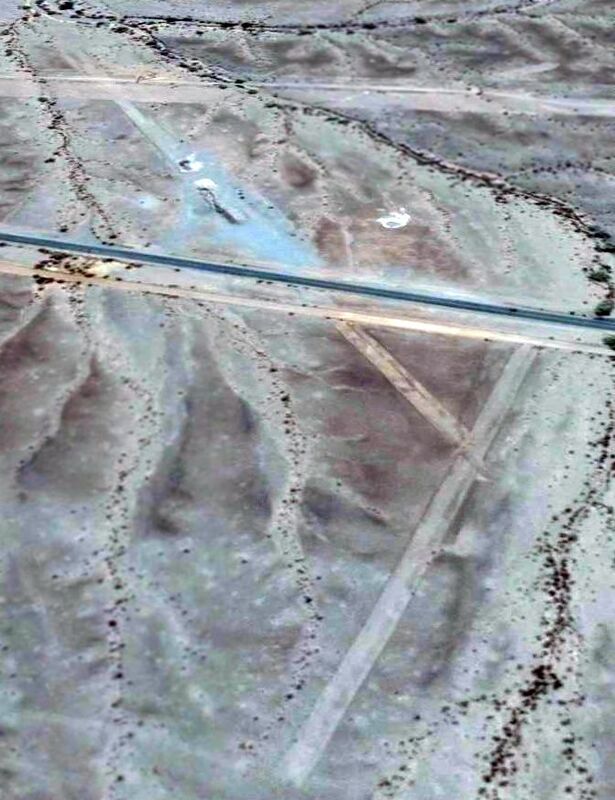 A 2015 aerial view of Holtville Airport, intact though deteriorated. 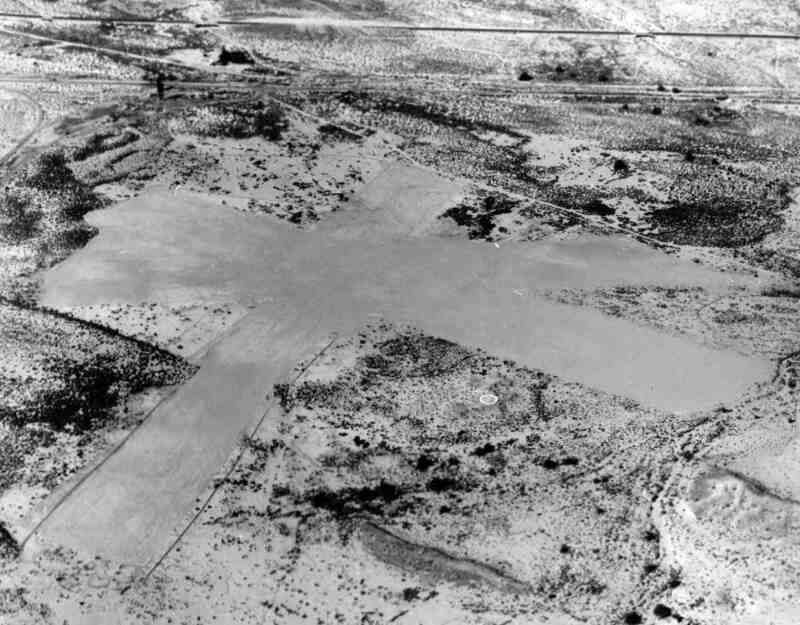 Both sets of runways were marked with closed-runway “X” symbols. A closeup from the 2015 aerial view of Holtville Airport, showing 2 USMC Bell-Boeing MV-22B Osprey tilt-rotors operating on the northwest end of the runways. even though both of its runways have been marked with closed-runway “X” symbols for several years. Thanks to Jeffery Sternberg for pointing out this airfield. "Holtville Aux", as depicted on the March 1951 San Diego Sectional Chart (courtesy of Chris Kennedy). 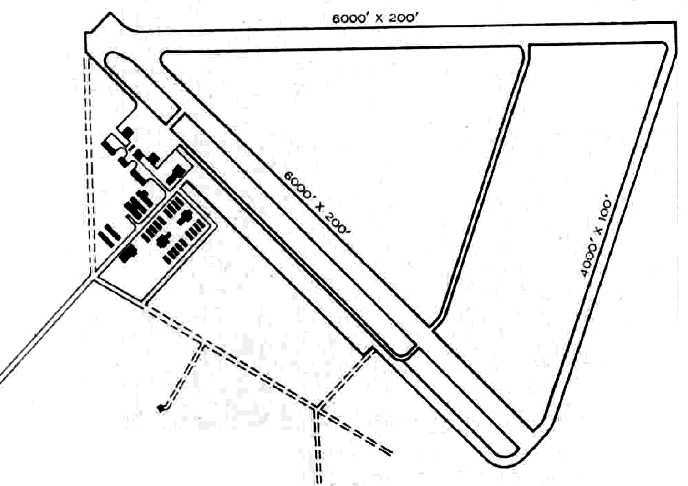 No airfield at this location was depicted on the 1943 San Diego Sectional Chart (according to Chris Kennedy). 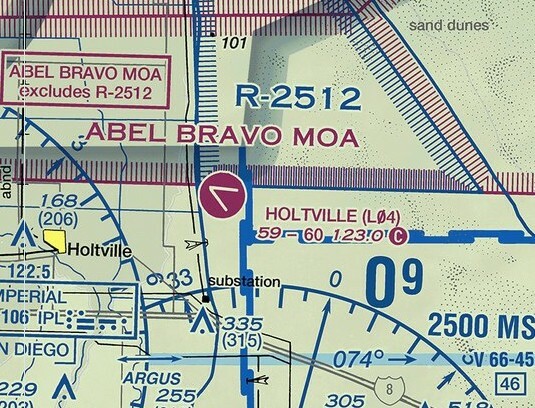 to use public land to build an airstrip in connection with Naval Auxiliary Air Station Holtville. (I don’t think this doesn’t include the approximately 7 miles road from the main base to the OLF). This airfield, along with other similar airfields in Southern California – Sweetwater Dam OLF & Ramona OLF - was to be used for Field Carrier Landing Practice (FCLP). refers to the landing strips as 'now under construction', so I am assuming the airfield opened in late summer or early fall 1944. Another Navy document says the construction of the field totaled $104,857. It is noteworthy that none of the documents I saw referred to the airfield as anything other than a 'Carrier Landing Strip' or a 'Carrier Landing Training Field'. it was also evidently known as “Sand Hill”, presumably to avoid confusion with the nearby Holtville NAAS, 8 miles to the west. Sand Hill was reportedly originally equipped with a catapult & arrester system for carrier takeoff & landing training. from 1944, 1945, 1946, or 1949 (according to Chris Kennedy). Roger Hillhouse recalled, “I spent 7 years at NAF El Centro as their civil engineer in charge of land & facilities. the outlying field [Sand Hill] & access road were not included. 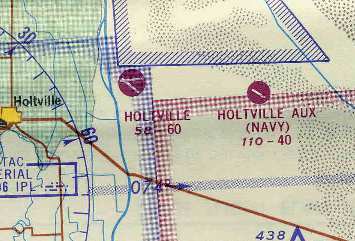 It depicted “Holtville (Aux)” as having a 4,000' hard surface runway. 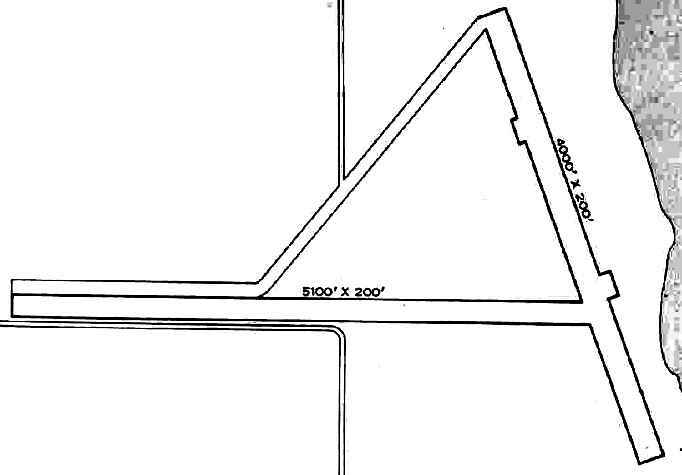 labeled as “Landing Strip”, with a narrow property outline of the “U.S. Naval Reservation”. The "Aerodromes" table on the chart described the field as having a single 4,000' asphalt runway. on a 1963 World Aeronautical Chart (courtesy of Chris Kennedy). 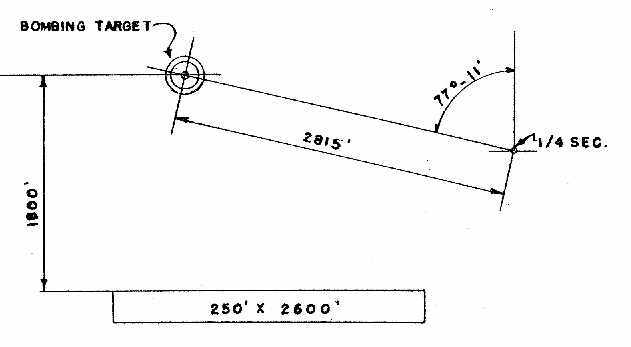 The length of the runway as depicted on the chart appears to be erroneous - it is listed as 40,400 feet! even though its parent airfield, the former NAAS Holtville, was depicted as a civil (not military) airfield. I'm very familiar with the old Holtville Airstrip & the paved strip to the east (Sand Hill NOLF). he stopped at the airstrip east of Holtville. While he was there, a Navy fighter came in & landed. The pilot shut down, got out & came over to where the doctor was parked. on the 1972 World Aeronautical Chart (courtesy of Scott O'Donnell). or the August 1976 LA Sectional Chart (according to Chris Kennedy). 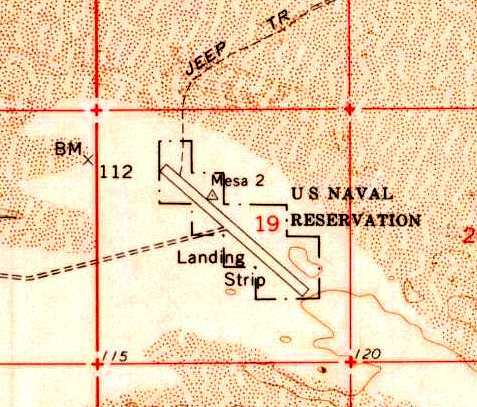 The runway was depicted on the 1979 USGS topo map, labeled simply "Landing Field". It was also depicted on the 1989 USGS topo map, labeled "US Naval Res". 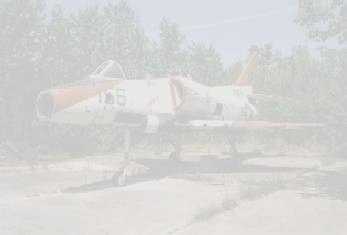 we would fly to this abandoned field at night & practice landings with night vision goggles. This was several years ago, but I'm sure they still do this type of training there. We called the strip 'Old Holtville'". 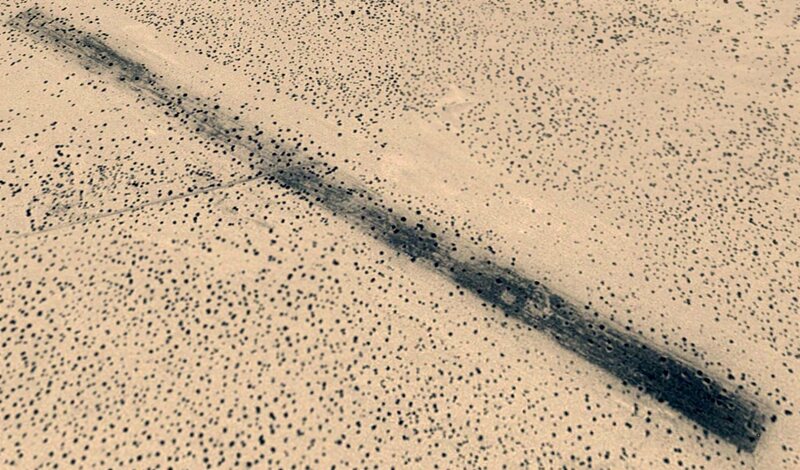 A 1996 USGS aerial view looking north showed the Holtville / Sand Hill airfield to consist of a single 4,000' runway, very deteriorated. It is not apparent if any buildings were constructed at the field. Francis Blake reported in 2003 that Sand Hill "has been used recently. and there are numerous fired military cartridges of recent manufacture lying on the runway. I found dated military items from 1942-62 at Sand Hill. it is my guess that Navy Seals or Marine Air Assault units are practicing there." still resides with the Navy, NAF El Centro being the landlord. a field I have viewed from the air many times as I fly my B 737 from San Diego to Houston. 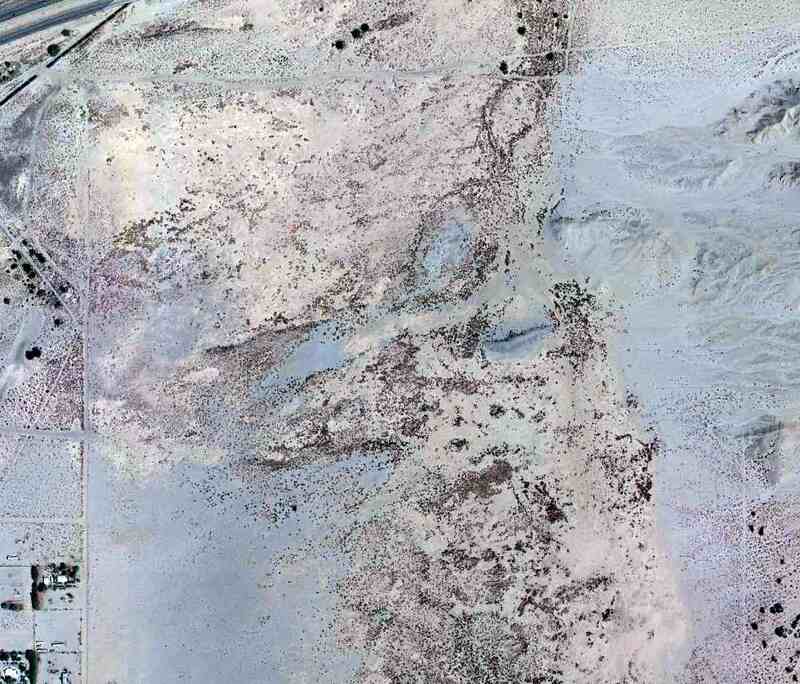 The field lies about 8 miles east of Holtville in an utterly featureless desert plain. My only guidance was an ill-remembered dirt road that led, more or less, from Holtville to Sandhill. The problem was, was that there were 2 ill-defined trails. Evidently, I must have picked the right one, for in a short while the vague outline of the runway hove into view. I made a standard, but low level pattern, and decided to check out the runway condition before attempting a landing. I made several south to north passes, and was disappointed by what I saw. The approach end (south to north) had some broken pavement where the previously seen markings had been painted. were in fact very substantial bush/trees many reaching easily 10-12 feet in height! Try as I might, I just could not find a suitable landing spot without incurring undue risk. but the there were several white painted tires laying there which could have posed a risk. Perhaps they have been deliberately placed there to discourage a landing? Woodrow continued, “Try as I might (and I certainly tried, having come a very long way) I simply could not risk a landing. My decision was based on a combination of runway conditions, existing vegetation & wind & density altitude considerations. 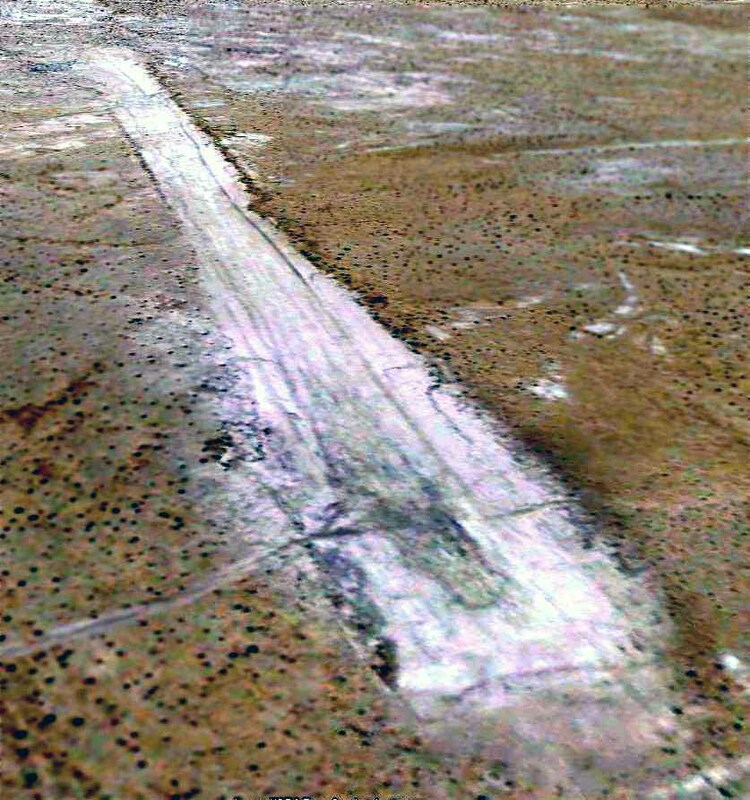 A 2008 photo of the Sand Hill runway by Woodrow Anselen (enhanced by Bill Grasha). Woodrow observed, “The absolute loneliness & desolation of this place is difficult to grasp. It lies abandoned & unknown in a harsh environment where it has slept away the decades for who knows how long. How strange it must have seemed to have an aircraft appear & make several low passes. before the June-September 2013 vegetation clearing by Marine Wing Support Squadron 74.
had an article entitled “Marines Clear NAF El Centro’s Holtville Carrier Landing Strip of Creosote Shrubs”. cleared the full 4,000' length of the old Holtville Carrier Landing Strip of all vegetation. The vegetation clearing will provide better access to the Strip for ongoing rotary-wing aircraft operations & pilot training. after the June-September 2013 vegetation clearing by Marine Wing Support Squadron 74 (courtesy of Chris Kennedy). 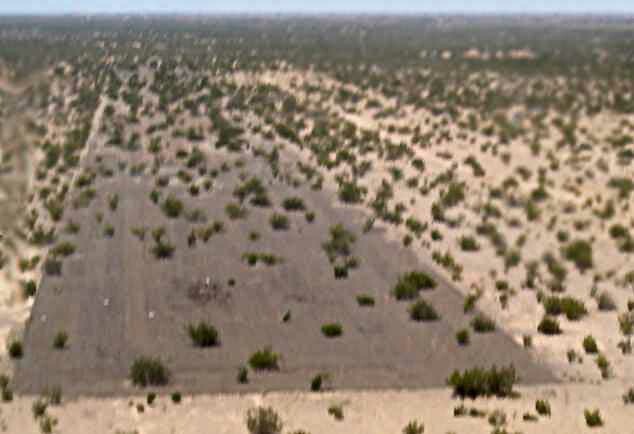 A 2015 aerial view looking north showed the Holtville / Sand Hill runway looking considerably more cleared compared to the 1996 photo. halfway between the Holtville Airport & the Coachella Canal. Thanks to Mel Shettle for pointing out this airfield. 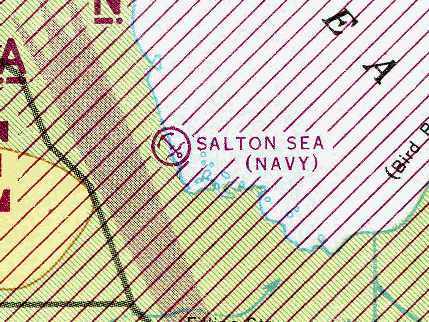 The “Salton Sea (Navy)” seaplane base, as depicted on the August 1943 San Diego Sectional Chart (courtesy of Chris Kennedy). as a seaplane operational area with bombing targets & for emergency landings. commissioned as Naval Air Facility on 10/8/42. and was used for seaplane training & as a seaplane ferry stop. a seaplane ramp leading down into the water, and a small group of buildings. it was painted with a large "DO NOT LANDING HERE" warning. in early 1942 Paramount Studios chose the site as the set for location shots for the movie Wake Island. They constructed a 4,000' clay airstripon the shoreline one mile south of the seaplane base. It only depicted the “Salton Sea (Navy)” seaplane base - but did not depict any landplane airfield. In 1942 & 1943, the Navy improved the original north-south Paramount runway & built a second, 5,100’ east-west runway. the Navy added ammunition magazines, a temporary tower, a parking apron, and a taxiway connecting to the seaplane base. The airfield consisted of 2 clay runways (5,100’ ' & 4,000' long). VT-20 was the first of 57 squadrons to deployed to Salton Sea for air-to-ground rocket training. Along with this new mission, Salton Sea was upgraded to a Naval Auxiliary Air Station in 1944. Barracks were present for a total of 638 personnel. was a 1944 National Archives aerial photo (enhanced by Bill Grasha) of the Salton Sea seaplane base (north) & landplane airfield (south). An undated (WW2 era) Navy photo of a PBY Catalina seaplane launching into the Salton Sea. Tests were also conducted of Jet Assisted Takeoff rockets (JATO) in 1944.
made over 150 drops of prototype atomic bomb shapes at Salton Sea. depicted both the Salton Sea Navy seaplane base & landplane airfield. as a 2,250 acre irregularly-shaped property containing 2 dirt & clay runways, the longest being the 5,100' east/west strip. However, the title of the listing said “Inactive”. 06469 Ocotillo Dry Lake OLF, and 08872 South Coyote Wells OLF. NAAS Salton Sea was disestablished in 1946.
when seaplanes left the naval inventory. which renamed the facility the Salton Sea Test Base. The AEC built a 5,100’ clay runway on higher ground one mile west of the seaplane base. They used the facility to conduct test drops of inert nuclear weapons from 1946-1961. A 4/21/50 aerial view (from the UCSB Library) showing the former Navy Salton Sea seaplane base (north) & landplane airfield (south). but the Aerodromes table described the status of both as "Closed". 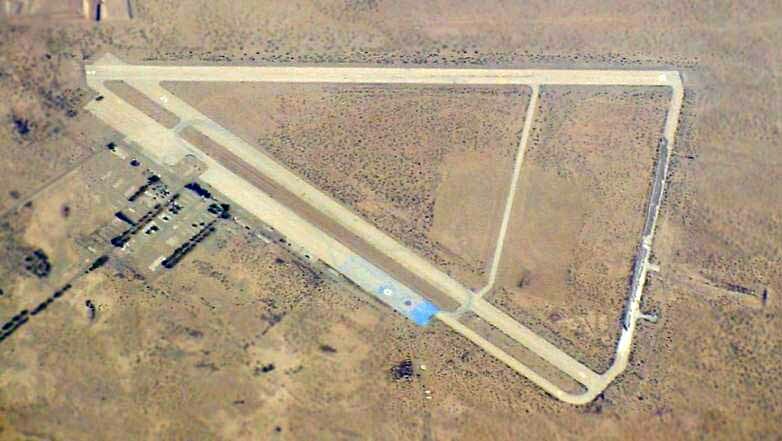 and specified the length of the airfield runway as 5,100'. 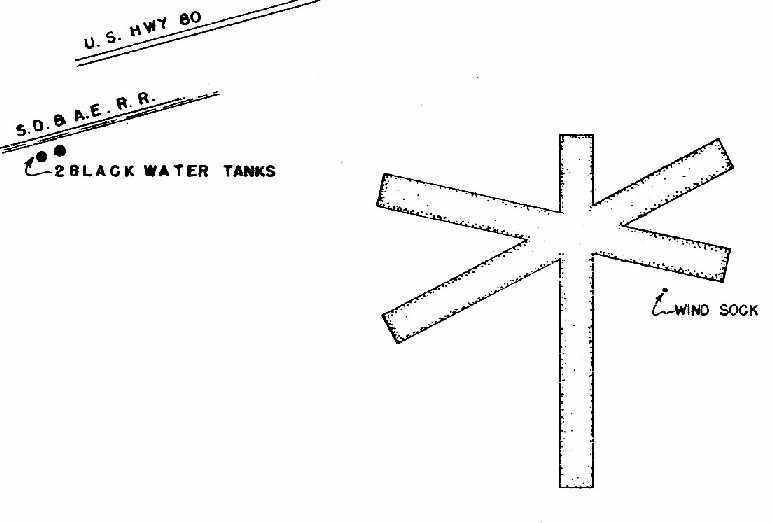 According to a 1995 report (according to Mike Friese), “The Dog Site Building (4070, Sites 7 & 9) was constructed in 1954 to support the NETP activities. 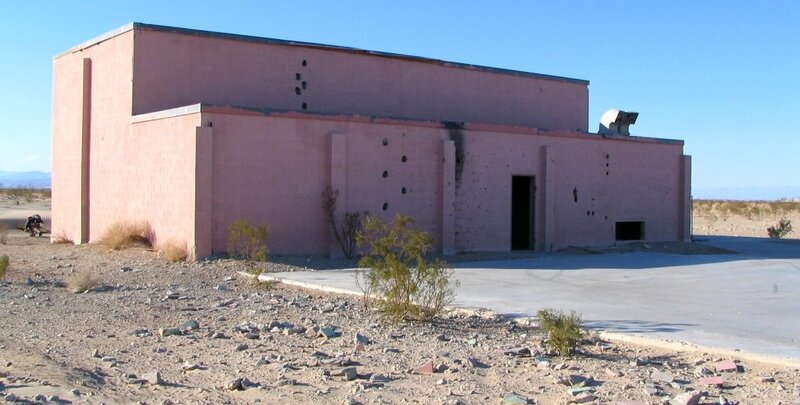 The building was used for environmental testing of weapons & maintenance, and for recording data. The weapons were tested by exposure to natural conditions outside. Different types of storage protection were used. Weapons components, including mechanisms containing depleted uranium & explosives, were disassembled, inspected, and reassembled in the building to evaluate the effects of environmental exposure. The weapons did not contain fissionable materials (i.e., enriched uranium, plutonium). The AEC ended Salton Sea operations about 1961.
which conducted parachute drop tests for the manned space program & other military systems until 1979.
and a series of dikes were built to prevent the Test Base from being flooded. However, the were no dikes to protect the Navy runways south of the base. The Marines & Navy SEALs have also used the isolated location for training exercises, and a Marine CH-53 reportedly crashed in 1979.
but the Navy airfield wasn't depicted at all on those same maps. An overview from the 1992 USGS aerial photo of Salton Sea NAAS, showing the 2 airfields & the test base. Top left is the AEC strip, top right is the former seaplane base & test base, lower right are the partially submerged Paramount/Navy runways. the shoreline has moved about a thousand feet toward the west from 1944-1992. As a result, much of the eastern portion of the former seaplane base (including the 2,100' parking apron) has been submerged. An October 1994 photo (courtesy of Mike Friese) captioned “Salton Sea Test Base Weapon Assembly Building 4070 (Dog Site Maintenance Facility)”. and will probably eventually be incorporated in the adjacent wildlife refuge. 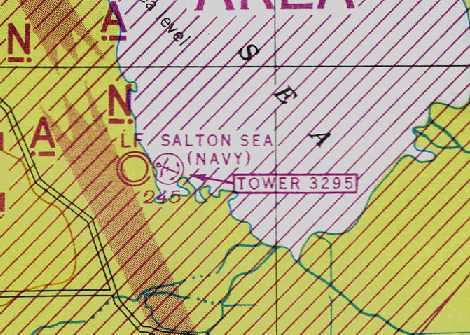 Neither Salton Sea airfield was still depicted (even as an abandoned airfield) on 2002 aeronautical charts. "was being used a few years ago by the company demolishing the navy base. Just west of there, the 1943 Humphrey Bogart war movie Sahara was filmed. I searched for & found the site in 1996 then wrote about it for a magazine." nothing now remains at the old Salton Sea base." Tim Tyler visited the Salton Sea Test Base site in November 2004.
plus a modern sign warning that the grounds of the former Salton Sea Test Base could have unexploded ordnance. We proceeded a little further north on CA-86 & tried turning right into the former base again. heading east to the Sea in the hopes of finding some sort of remains. 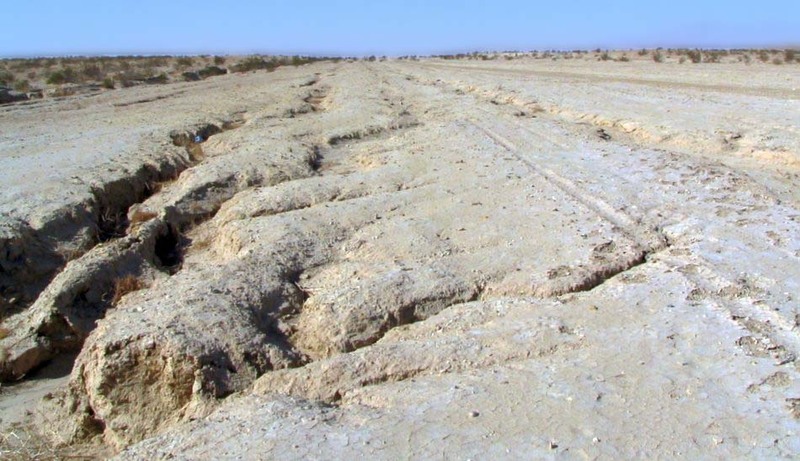 but is was a very rough & rugged 4WD track. (looked like many 5.56mm or 0.308 rounds, and one or two 0.50s). we got stuck in the sandy dirt, about a third of a mile west of the water. After 2 hours of trying to free ourselves, sunset was only a half hour away, so I figured I’d better make a phone call. when an old-timer with a pickup truck pulled up & confidently stated he could assist us. Turns out he’s been coming to the area for decades, and was camping out about a mile away. so this great Samaritan came on over, and using his tow strap & mine, we finally got my vehicle free." that appeared to be right along the water, and about half a mile apart. the buildings had been demolished either by military training action, or contractors, but that ordnance is still occasionally found. which gets softer the closer you get to the water. The Salton Sea is 200+ feet below sea level, and it’s fed simply by runoff from all of the agriculture crops in the valley. and I good chunk of it is in private hands. plus the occasional idiot driving around in a yuppie-type 4WD to look at the old military site!" A January 2007 photo by Kurtis Clark (enhanced by Bill Grasha) looking along the remains of the single runway on the west side of NAS Salton Sea (also referred to as the AEC airfield). Kurtis reported, “My understanding is that the area has been returned to the BLM. It was all open access except at the site of the Sea Base, where they built ponds to remove salt from the lake (failed experiment). 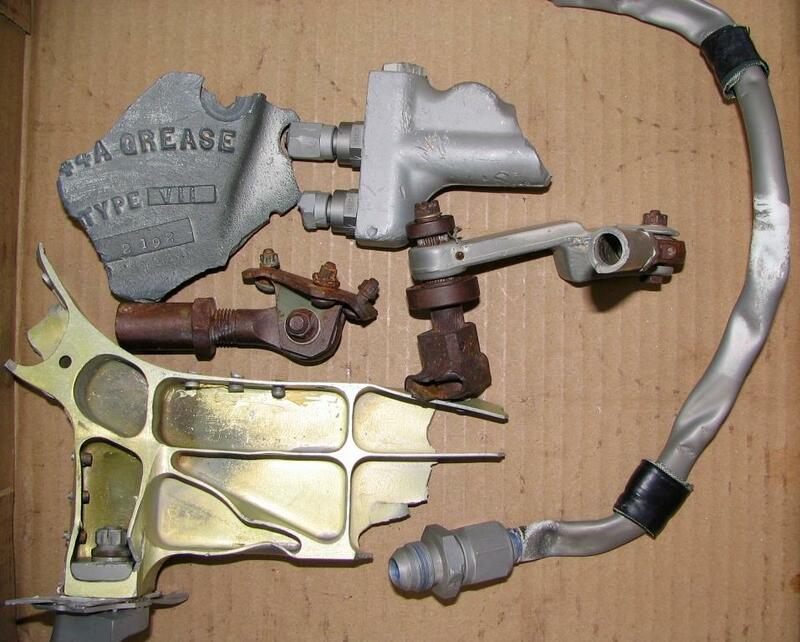 A January 2007 photo by Kurtis Clark of “several parts [found] in the sand, apparently from aircraft. A January 2007 photo by Kurtis Clark of the interior of the Weapon Assembly Building. A 5/25/09 aerial view looking northeast at the remains of the Salton Sea NAAS landplane airfield. The north/south runway of the former Navy landplane airfield had been submerged. The remains of the east/west runway & the taxiway were still barely discernible. As seen in a 5/25/09 aerial view (enhanced by Bill Grasha) looking southeast, the former AEC airfield consisted of a single 5,100' east/west runway. 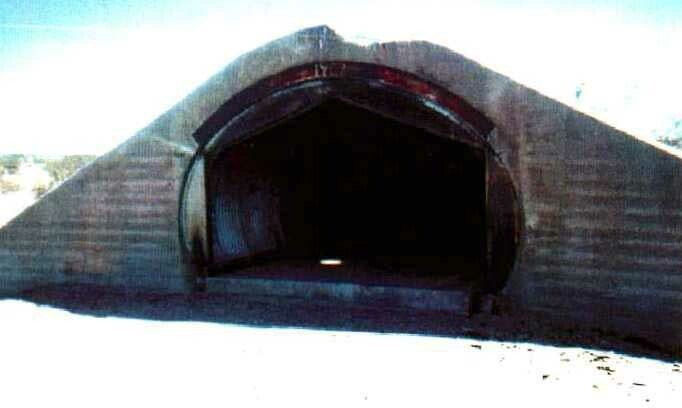 A 2009 photo of a bunker at the site of Salton Sea NAAS. Mike Friese reported in 2018, “I have wandered the Salton base on a couple of trips. Building 4070's roof is now missing & the gantry & all the steel inside structures are gone.